I had a childhood friend that taught me several lessons that I'll never forget. His name was Jim and he was a dreamer. He always liked to think up new ways of doing things and had a way of bringing others into those dreams. He was a tremendous friend that understood things beyond his years. Jim and I were about 13 or 14 years old farm kids. I knew him most of my life and we were always at each others homes, especially after we got our motorcycles. One day Jim walked me down to his parents back pasture. It was quite a hike but it was worth it when he painted out his dream for us. The pasture area sat at the bottom of a wooded hillside a short distance away ran a small creek. Jim took me over to a specified location just inside the woods and said, "Well, what do you think?" I said, "Think about what?" He said, "About the cabin that we're going to build?" I remember thinking that he was crazy, but he was insistent. He told about all the fun we were going to have and how it would be a whole lot better than a tent. By the time he was done painting his dream, I was sold. I said, "When are we going to start?!?!" Jim said, "Oh, we need to start by building the corral." I said, "A corral? What for?" Jim replied, "In case we need to put horses or cattle into it?" Well, it was Jim's dream, so I agreed. I remember working for several days digging through the virgin soil under the trees, hitting roots, and complaining an awful lot. I remember taking axes and chopping down trees and dragging them over to the selected location. We trudged onward, until about a week later (It seemed more like a year) we finished. As we stood back admiring our corral, Jim said, "Good now we can start working on the cabin!" As we walked back to his home that evening, I remember Jim turning to me and saying, "You know Terry, I have to be honest with you. 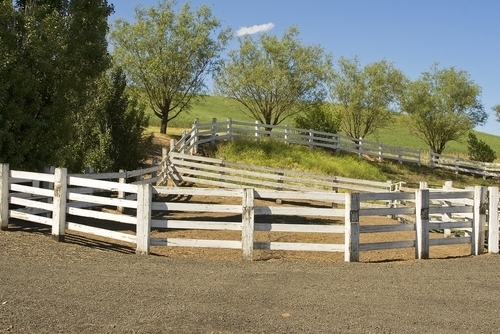 I didn't want us to build that corral for horses, or cattle." I said, "Then why did we build it?" Jim answered, "We built it so that I would know if you really would help me build the cabin." Jim understood the importance of making dreams real and that dream only come true when commitment is involved. We did finish building the cabin later that year, and it was a source of fun and pride for many, many years to come. It all started with an idea, a dream, and someone who understood the importance of commitment. I am now an administrator of an elementary school and Jim taught me several lessons that I still apply today. I still try to paint my dreams in vivid colors and make them touchable for others and I still work with my staff to build corrals. "Your words are continually educating others around you. Let them create a portrait of enthusiasm and faith"